Exploring the Universe and other MMO Sci-Fi & Mystical Realms. Another edition of …What’s in my Hangar? So Rixx Javix started this thing recently over on his blog posting about what’s in his super secret hangar. It was a pretty cool post. That’s a lot of ships he got, but then he’s been at EVE for a while too. I thought I did one of these hangar things before, but can’t find where on my blog its hidden. Oh maybe that was when I played that other MMO. Then Jester upped it up another notch and posted even more ships. Geezzz that’s a lot of exotic minerals and metal’s in his hanger for ships. Those guys play ship tags allot. EVE Hermit even chimed in with a post of his own which was rather cool as well. I’m just not sure who else did. I figure I needed to get around to making a post about this as well. I’m game . 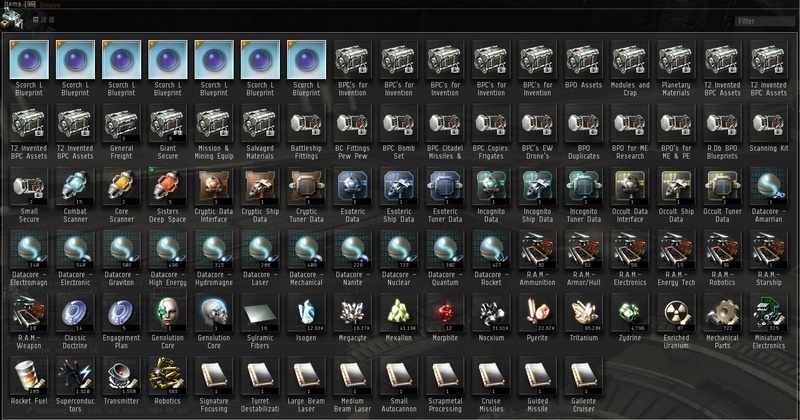 It’s always interesting to see what kind of ships we all as capsuleer’s collect and keep around in our hangars based on how we all each play EVE. As well just what exactly is in that super secret hangar of yours. Fortunately for me this was a fairly easy task since I tend to keep an organized hangar try to keep my asset spread low. Not really that all into Shiny Ships. Every single ship in my Hangar was built by Me, except the EVE Anniversary Echelon ship! All the Rookie Tutorial Ships I still have. 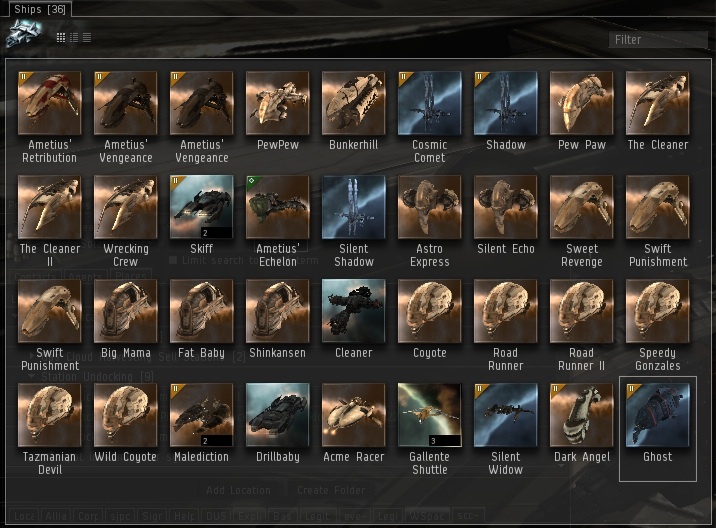 After 2 years of playing EVE that’s all the ships my main character Ametius’s own. Not really all that into ships or shiny ships! I just get/build what I need and that’s about it. 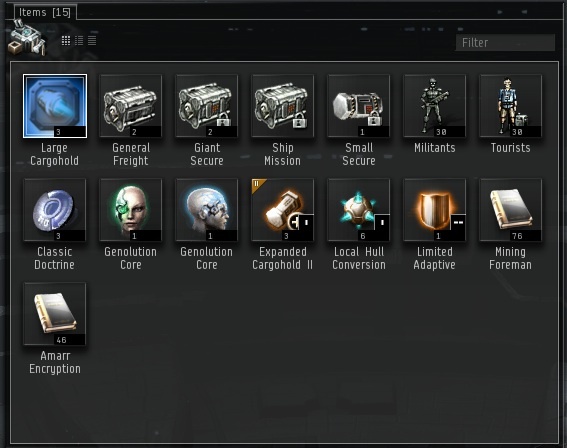 I still have all the Rookie ships I originally got from the Tutorial Missions when I started EVE 2 years ago, getting a few T1 Frigate, Destroyers, Industrial hauler’s from doing those missions. Can you believe that? Yeap still got umm and occasionally use one of them rigged for something. All the rest of the ships in my hangar I built all myself except the Echelon which was a EVE anniversary gift some time ago. Well after all I’m an Industrialist so I tend to build and Invent my own ships to fly. OTEC Cartel & Monopoly on T2 Moon Materials aren’t gonna hurt my ship needs the slightest. Plus anything T2 built gets passed onto the capsuleer in higher prices. Most the ships in my hangar are Industrial ships overall, pretty much aligns with my usual activity. Most the ships I fly daily happen to be a Frigate’s. My Buzzard see more fly time by far than any other ships I own probably a good 80% the time. Next up is the Crane I fly probably the other 15% the time. And less than 5% the time I would guess I fly any other ship in my hangar. For all those ships only 2 of them really see fly the hostile skies. That’s about all I ever usually need to run my business across 7 major regions of empire space. The Skiff’s there in hangar I recently Invented and produced and those 2 were sold earlier today. Wait no Faction Ships? Nope! 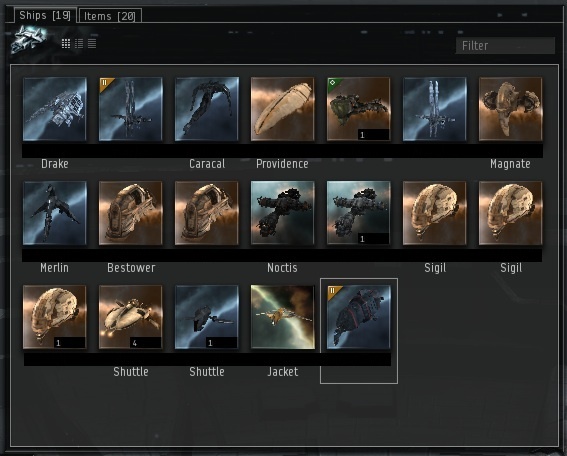 No Billion ISK T3 Ships, Nope. I live in Empire, I’m relatively poor. I can’t afford such luxury ships. Plus what the hell am I gonna do with such ships anyway, I don’t do Missions much and don’t do Incursions or non of that stuff. Your thinking of that other guy that like shiny ships. Main Character Ametius Hanger: That’s a lot of stuff. Like my hanger organized for running business. This is the rest of the station hangar and since I keep my asset spread low, that’s pretty much it. Every now and then my assets get spread out across the galaxy somehow, but eventually I have to rein it all in and tidy things up or get rid of stuff. I guess that’s my super secret hangar. Nothing special in it of course! There is a lot of stuff in all those containers though. I keep things organize to easily be able to find stuff and keep things sorted. I pretty much know where exactly everything is and what’s in every single labeled container. I’m a Trader/Industrialist/R&D Inventor so that’s the kind of station hangar I keep and probably why it looks the way it does. Works for me. So what’s in all those super secret containers? Stuff! Its how I keep things organized for operations. 3536 BPC’s for use for Invention (Yet to be used in Invention). 377 BPO’s (All Researched BPO’s of some sort). 2982 Various pieces of Module Crap of some sort. 224K m3 of various (PI) Planetary Material. 63 various other Full Run BPC’s for making more stuff. How much assets is in that hangar? I have no clue! I just know its allot. But it all helped to build my regional business in one form or another. Trader Alt Fleet of Ships: Don’t really own that much ships, mostly Industrials. He’s not really that into ships or shiny ships! Just the basic ship necessities. Built all of his ships except the Providence Freighter and the Primae we all got as a gift a couple of EVE expansions ago. I think he also got a Hulk in a station somewhere also for once in a rare blue moon mining. Again most ships are mostly Industrials. The Buzzard and the Crane both between then probably see 98% of sky time. Few Combat ships, mostly they just to run missions every now and then to raise standing with some NPC Corp so I can pay lower Taxes. You probably didn’t think that was a reason why some people run missions I’m sure. Really for a Trader running business in 7 major regions of empire space they really aren’t allot in this hanger. Barely anything exciting there to look at. Probably one the most boring hangar you ever seen. Not as interesting as Jester’s hangar or as stylist as Rixx’s but hey that’s my hangar like it the way it is. All in all I use most those ships in the hangar at some point or the other, some much more used than others. So what’s in your super secret hangar? Spam Blocked. Gank the Spam!